Miniature plugs and jacks provide dependable, quick connections and easy installation of fine thermocouple wire and metal-sheath thermocouples. Accepts wire from 0.001" diameter to 24 gauge. Polarized pins make it virtually impossible to mismate. Large double wipe jack inserts assure tight grip and low signal loss. 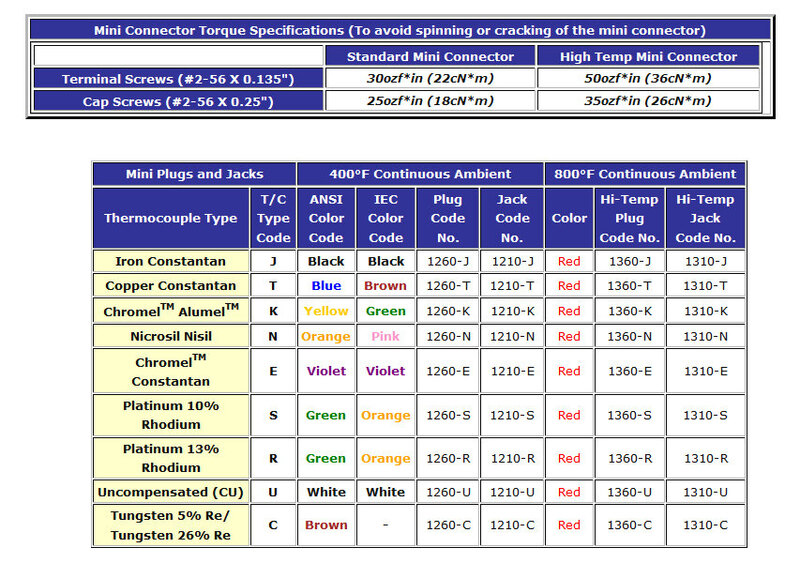 Due to exclusive isolated screw design, contact is all thermocouple alloy from wire entrance to wire exit. ANSI calibration symbol and polarity symbol are molded on connector face. Surface mounting and stacking made easy by molded-in clearance holes. Exclusive Jab-In® terminals require only 1/4" of insulation removed. Wire is sandwiched between contacts of thermocouple alloy without damage. Looped wire ends are eliminated. Simple two-piece construction. Removable cap with semi-captive screws exposes terminals without loose parts falling out. Elastomer bushing provides wire strain relief. Braze-on sheath adapters are brazed or soldered to sheath. Crimp-on adapters are crimped on sheath using crimp tool. Bushings and adapters are locked into connector by cap. For corrosive applications, gold plated contacts are available. Caution - system errors can result from use of plated contacts if significant thermal gradient exist at connector. Click the button below to add the 2-Pole Mini TC Connector to your wish list.